Interested in getting notified when Microsoft Visual Studio Team Services (VSTS) goes down for maintenance or when it comes back up? Well, now you can, using this simple Google Chrome extension. Already interested to install? Wow, this feels great! Click this link below. Does it add an icon to Chrome toolbar? Yes, it does..and you can monitor the status straight from the toolbar via the extension icon. The icon has a green dot when VSTS is up and red dot when VSTS is down. 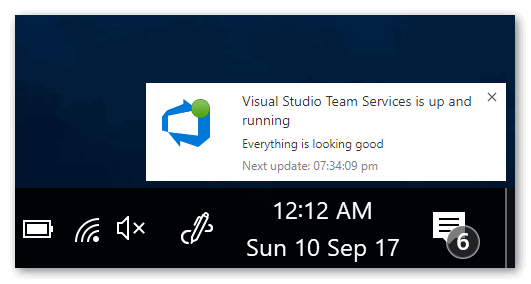 Click on the icon, and you will see that the extension pops up a window displaying the current status of the VSTS along with any message which VSTS team has posted about the status. You also see when the next check for VSTS is made. Currently, this extension checks the status every 5 minutes. Are notifications not for you? - Ah, I remember - my wife hates them too! That’s why I made notifications optional. Uncheck both the checkboxes in the Options and extension won’t bug you again! Happy? Didn’t I provide the link above? I see…you were not convinced at that time right? Do you like it? Yay!! Please leave a review or the rating or both :-). Hate it? Okay, that is sad to know - But you can give the feedback why you hate it. Found a bug? - Yikes! It worked fine on my machine!! I promise! - Now that you have found it, please report it to me here. I will definitely try to fix asap. I stare at Visual Studio (not Chrome) all the time! Okay, okay - We do have Visual Studio extension for that - Happy?